In Sedlec, a suburb of Kutná Hora of the Czech Republic is a small Roman catholic church known as ‘The Sedlec Ossuary’ or ‘The Cemetery Church of All Saints’. The name cemetery is a little untypical for a church, but that is exactly what the church is. Inside the church there are thousands of dead bodies hanging on the walls and from the ceilings. 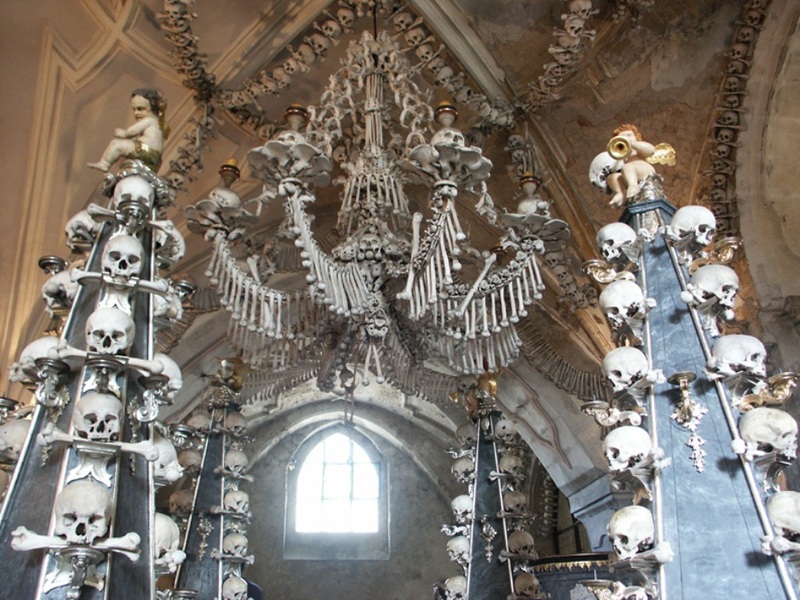 This horrifying church is the most popular tourist attraction. The history of the church dates back to 1278. It is said that during that time Henry, the abbot of the Cistercian monastery in Sedlec was sent to the Holy Land by King Otakar II of Bohemia. While returning Henry brought a small amount of earth from Golgotha, where Christ was crucified and sprinkled it over the abbey cemetery. The story of his holy act spread and the cemetery of Sedlec became the desirable burial site for all the Central Europeans. Thousands of people were buried there in the 14th century during the Black Death and in the 15th century after the Hussite Wars. The number of burial started exceeding the space available and the cemetery had to be expanded. In 1400, a Gothic church was built in the center of the cemetery. The church had a vaulted upper level and a lower level to be used as an ossuary for the graves unearthed during construction. After 1511, the work of unearthing the skeletons was given to partially blind monks. It is said that these monks began piling the bones in an artistic pattern. There is also a myth about a monk who went mad and started making things from the bones. In 1870, the Schwarzenberg family who were then the landowners hired a woodcarver named František Rint. Rint did the decorations and sculptures of the church with human bones. Inside the church are skeletons of about 40,000 to 70,000 people. The walls and ceilings of the church are artistically decorated with human bones. The corners of the church are occupied by huge bell shaped piles of bones. 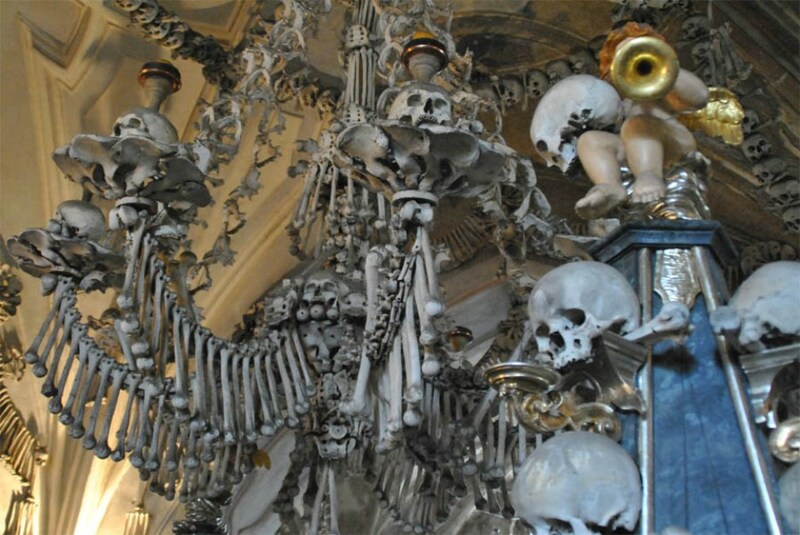 From the center of the church hangs a huge chandelier of bones. The chandelier is made of one of every bone in the human body and is surrounded by garlands of skulls draping the vault. There are rows of skulls and bones hanging from the ceilings. There is display case that shows skulls with wounds caused by different weapons of the mid century. There is a large coat of arms of the Schwarzenberg family; a raven pecking the eye of an invading soldier is best part. Other attractions are the piers and monstrances flanking the altar, a skull candle-holder and the signature of the creator Rint also done on finger bones on the wall near the entrance. The human bones all around in the church reminds us of the short human life and the unavoidable death.